A classic view of Boston. A remarkable chromolithograph map and view of Boston Harbor from Boston to Provincetown. The view includes all of Cape Cod Bay, Quincy Bay and Dorchester Bay with the communities of Boston, East Boston, South Boston, Dorchester, Quincy, Hough's Neck, Mingham, Nantasket, Duxbury, Plymouth, Cohasset, Scituate, and Provincetown noted. 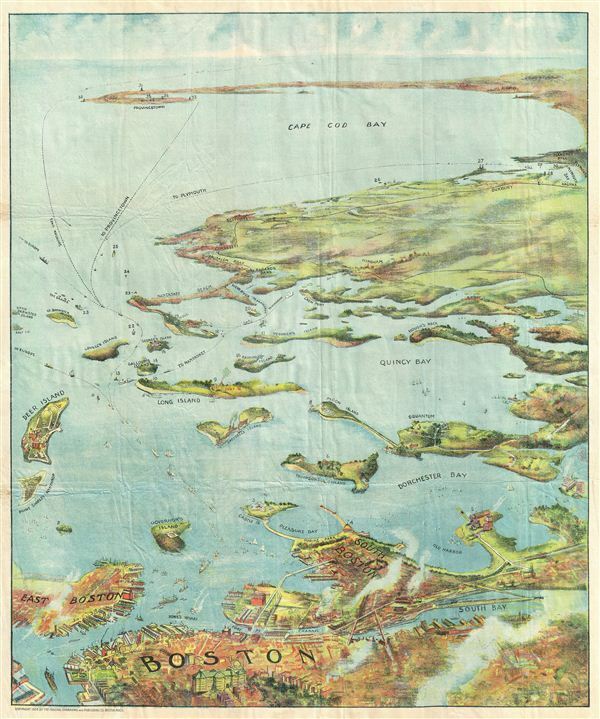 Also notes many of the islands in Boston Harbor including Moon Island, Spectacle Island, Thomson's Island, Long Island, Governor's Island, and many others. Ferry and steamboat routes are noted. Smoke rises from Boston's many manufactories. Today such might be construed as symbol of pollution and urban defilement, but when this view was printed; busy smokestacks were symbols of commercial prosperity and industrial optimism. Published by John F. Murphy of South Station, Boston. Dated and copyrighted 1905 by the Federal Engraving and Publishing Co., Boston, Massachusetts. Very good. Original fold lines visible. Some wrinkles nicely flattened. Blank on verso.